Somerset County, Pennsylvania is a county of great accomplishment and rich history. As we move ever forward, it is essential that we return to the past of one of its small, most forgotten areas, the Turkeyfoot Valley. A past that, as with all history, is in danger of being lost if it is not stabilized and exposed through museums, books and other mediums. Colonel George Washington and a small party were sent to the junction of the Youghiogheny and the Casselman rivers to survey the area. He was probably the first white man in the area. After looking the district over, he decided that it would be a good place for a fort to be established. An Indian guide told him to notice the way the three bodies of water, the Youghiogheny, the Casselman, and the Laurel Hill creek joined together to form the shape of the turkey foot. Thus the name of the area probably originated in this manner. Within the valley there lies two townships: Upper Turkeyfoot Township and Lower Turkeyfoot Township. In 1754, Turkeyfoot townships embraced fully one-sixth of the entire county. The territory west of the Allegheny Mountain was not open for settlement until after the Indian title had been extinguished, and this did not take place until the treaty of Fort Stanwix, which was made November 5, 1768. Up to that time there could no legal settlement be made on any lands in this part of Pennsylvania. After the French had been expelled from the country, something in the way of an agreement appears to have been made by the Indians. More men were farmers than anything else in 1798 in the valley. The coming of the railroad through Confluence in 1871 added greatly to the growth of the area. In the early 1880’s it was the largest shipping point on the Pittsburgh division of the B & O Railroad, between Cumberland, Maryland, and Connellsville, Pennsylvania. A great deal of the timber was brought down the river to this point, whence it was shipped by rail to various markets. Nearly all the charcoal made in Lower Turkeyfoot Township was shipped from Confluence. The area owes its historic growth to its location in the Appalachian coal region. The use of coal as the primary fuel of American industries sustained the county’s economic growth until the middle 1940’s. Due to the rich history of the area, a group of volunteers decided to form an organization to preserve this history for the future. The Turkeyfoot Valley Historical Society was founded in 2002 and officially became a 501(c)(3) organization in 2003. The Society is a non-profit volunteer organization dedicated to the preservation of the history and heritage of the area. It collects, studies and preserves historical documents, buildings, sites, locations and other items of historical interest and aesthetic and social value relating to the history of the Turkeyfoot area and its people; fosters interest in and appreciation for local history and carries on research regarding that history. 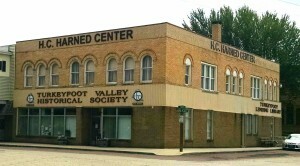 In December 2005, the society purchased the building at 600 Logan Place in Confluence, PA from the Turkeyfoot Area Medical Association (TAMA). The two story building covers approximately 2000 square feet per floor. Restoration of the building exterior and interior first floor began in 2006. The official opening of the building was on October 4, 2008. The renovation project was accomplished by funds received from H.C. “Joe” Harned, and from grants from the Community Foundation for the Alleghenies. Within the building the Society operates a museum which receives visitors from all 50 states and many foreign countries each year. Some of our artifacts include historical photographs, postcards and newspapers. We also have historical items from the Civil War, WWI, WWII, local businesses, and organizations. Our building which was the first bank in the area has many artifacts and the actual vault of the First National Bank of Pennsylvania. The building also houses the Turkeyfoot Lending Library and Confluence Tourism Association. In addition, the Society sponsors roughly 10 special programs each year that are free and open to the public. Some of the more notable events and programs offered to the community have ranged from Pennsylvania Commonwealth Speakers to reenactors such as Mary Todd Lincoln, French & Indian War soldiers, Civil War soldiers and George Washington. We have even twice had the privilege of having the Civil War era “Wildcat Regimental Band” of the 105th Pennsylvania Volunteers. They are nationally known and play regularly at Gettysburg National Battlefield, Antietam National Battlefield and Harper’s Ferry National Park. In 2005, two scholarships were funded through contributions made by Mr. Harned to the Community Foundation for the Alleghenies (CFA). CFA administers the fund for disbursement through the Historical Society for post-secondary education at an accredited institution for up to four years. We are a small but mighty group as you can see from the following information compiled about the Turkeyfoot Valley Historical Society… On a cold, dark, snowy night – January 9, 2002 – ten inspired people met at the Confluence Community Center to discuss how to organize an historical society for our area. From that humble start, our organization now has 286 members – from Pennsylvania, Maryland, Arizona, California, Connecticut, Florida, Georgia, Indiana, Kentucky, Minnesota, Mississippi, Missouri, New York, North Carolina, Ohio, Oklahoma, Texas, Virginia, Washington, West Virginia and Canada.